It’s fair to say that not a single one of the American contingent of watch media got a good night’s sleep, but that’s to be expected given the timezone shift and the amount of alcohol that had been consumed the night before. 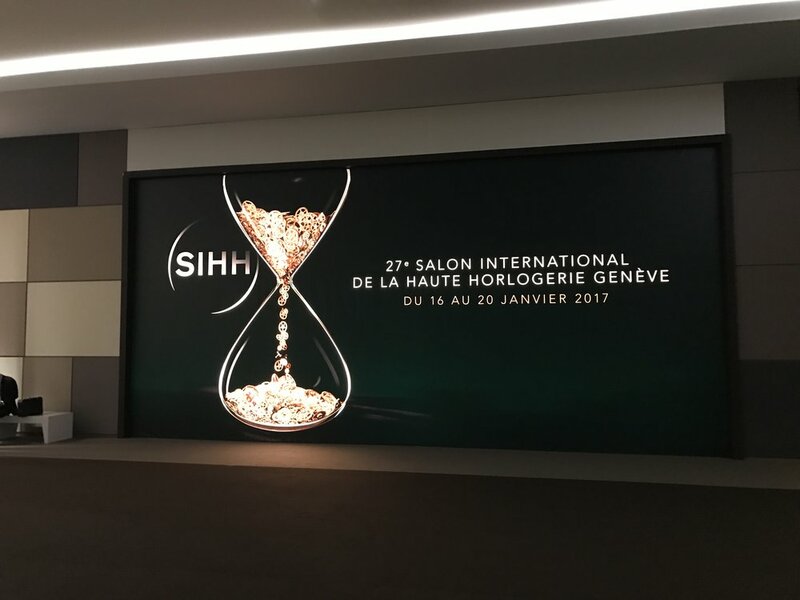 (Whether or not this is SIHH tradition is immaterial; it’s RedBar tradition.) And so it was, that we found ourselves with cold bones and bleary eyes, blinking in the cold winds off blowing Lac Leman, waiting for the shuttle bus to the PalExpo convention center. Don’t worry, this is as it should be. In what is now becoming a tradition — and perhaps a good luck charm — our first appointment was with Jaeger-LeCoultre, and let us assure you, they did not disappoint. While it has become de rigueur of late for brands to show their hand prior to SIHH with press releases and the like, JLC continues to play their cards close to the vest, which is why we were completely unprepared to receive the new Master Control series. The collection is comprised of three pieces — Date, Chronograph and Geographic — and they’re all pretty much perfect. Oh, and let’s be clear here, we do not use the word “perfect” lightly, so trust us, it applies. Steel cases? Check. 39-40mm? Check. Clean, purposeful designs rooted in the past, yet firmly of the present? Double check. And pricing is suitably aggressive, with the Master Control Date coming it at $5K, while the range-topping Geographic retails for $9400. If there’s going to be a breakout star of the show, folks, this is it. Naturally, JLC wasn’t content to stop there. Also on hand was an updated Rendez-Vous collection, which pointed to one of the first trends of the show — the increasing importance of the women’s market to major manufactures. For 2017, the Rendez-Vous adds a larger case size — 38.2mm — and an new complication — mechanical alarm — to the mix. The best part? Most versions are available in stainless steel. Boom. An added bonus was the Geophysic Tourbillon Universal Time, which takes the Geophysic Universal Time and cranks the dial past "11" with the addition of a flying tourbillon escapement. Not only is this completely, utterly and jaw-droopingly awesome, but it's also the first time that a world timer and a flying tourbillon have been combined in a wristwatch. You wanna know the best part? The entire dial rotates with the passage of time. Our next stop was Richard Mille, where the belle of their particular ball was the RM50-03 McLaren F1, a carbon and graphene-cased technical masterpiece — the first of its kind; the composite material is 6 times lighter than steel and 200 times stronger — that weighs in at a mere 40 grams. This is a record for a spilt-second chronograph (to say nothing of a split-second chronograph that also sport a flying tourbillon). For such an imposing piece to weigh so little is a bit startling when you first put it on, but once its $980,000 price tag sinks in, it starts to wear a bit heavier on the wrist. 75 of these technical terrors will be made, which makes you wonder just how many billionaires out there are pining for a featherweight chronograph, but these are concerns that float miles above our pay grade. Clearly, if you build it, they will come, and let’s be honest here, this is one badass chronograph. No SIHH is complete without acknowledging that IWC’s booth is marvel of architecture, engineering and sheer will. In IWC’s lexicon, 2017 is the Year of the DaVinci, and so it was that they built an Italian palazzo smack dab in the middle of the PalExpo, replete with remarkably convincing faux-marble floors, sweeping staircases and towering columns. If you told us that George Kern himself hewed the imposing set piece out of Carrara marble himself, we’d probably believe you. Yet, for all the theatrics, the collection being celebrated is remarkable not for its bombast, but for its restraint. Originally slated to debut in 2016, the new DaVinci collection eschews the tonneau-style case that has all but defined the contemporary collection, and refocused itself on ladies watches; to this end, round cases and floating tear drop lungs are the name of the game. The DaVinci Automatic 36 can be had in gold with diamonds, as well as a moohphase complication, but as with JLC, sensible steel is also on the menu. The menfolk get a 40mm case and the option of an IWC-trademark ardoise dial to complete the proceedings (our favorite). The new Laureus Chronograph is stunning in metallic, sunburst blue, while the range-topping Perpetual Calendar Chronograph and Tourbillon Retrograde Chronograph make the appropriate statements (i.e. “bold”). All told, it’s as complete a collection as one could hope for. That said, the novel lug design, which actually has a precedent in DaVincis of yore, may be a sticking point for some collectors. Even so, aesthetic opinions aside, they are supremely comfortable and in the case of the tourbillons, they make the watches hug the wrist in a fashion that belies their size. The big news from Vacheron Constantin, came in the form of two absolute stunners — the Les Cabinotiers Celestia and the Les Cabinotiers Symphonia Grande Sonnerie 1860. The former is a 23 complication masterpiece (the most complicated wristwatch that Vacheron has ever made); the latter is Vacheron’s first sonnerie. Of course, at a cool million dollars, these pieces aren’t for everyone. Indeed, the Celestia is all but a piece unique, so what of the average rich guy and girl? Well, the 37mm Overseas is now available in a steel case, and can comfortably lay claim to being a truly unisex watch. If we had our druthers, we’d probably ditch the sub-seconds dial in favor of a traditional second hand, but overall this is a welcome addition to the range, and yet more evidence that the ladies’ market is finally starting to get their due. The first thing you need to know about brothers Bart and Tim Gronefeld is that they love what they do. Their energy is infectious, and that enthusiasm translates rather effectively to their watches. The star of their booth this year was Grand Prix D’Horlogie de Geneve award-winning piece, the Remontoire 1941, a rather impressive manual-wind piece with a constant-force escapement. However, as stunning as this watch was when it won the top price at the GPHG, it has since been made even more so with the the option of a handmade dial from fellow independent, Kari Voutilaninen’s in-house dial manufacture. Both guilloche and enameled, the new dials are nothing short of amazing, and they can be special ordered in almost any color combination. The sky — and the owner’s taste — are the only applicable limits. Our last stop of the day was spent with Christophe Claret and their new Maestro. Designed to be an “affordable” option in their catalong, clocking in at under $100K, the watch incorporates their traditional “Charles X” bridge design in an entirely in-house manufactured manual-wind movement, which is housed under a unique boxed sapphire crystal. This dramatic presentation serves a couple purposes, not least of which is to showcase the movement’s novel date display — a cone with revolving elements that are highlighted by two posts — as well as a “memo” complication that can be switched on or off with press of a button. This last feature, which serves as a mechanical string of twin on a finger, is cheeky, to be sure, but as a reminder, it serves its purpose admirably, albeit expensively, in spite of the piece’s mandate as an “affordable” Claret.